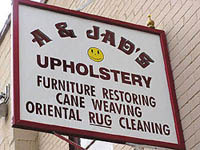 A & Jad's is a family owned business specializing in carpet cleaning and repair, oriental rug cleaning and repair, reupholstery and furniture repair & refinishing. A & Jad's provides traditional craftsmanship and old world quality you can trust. The owner of A & JAD's, Jad Ibrahim, grew up in the business. In 1951, his father, Adeeb S. Ibrahim, established Star Rug Upholstery in this very same location. It was then his family residence and he made room for a workshop in the house. He started out installing wall-to-wall carpet and then added oriental rug cleaning, sales, and service. As time progressed, furniture upholstery and furniture refinishing were added. Jad carries on the family tradition. The shop is still located in the same building and offers the finest quality services in the metro area. 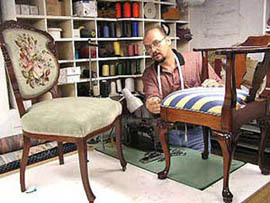 Custom upholstery work is offered for both residential and commercial services. 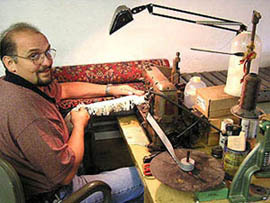 Be it a simple stitching repair to a full restoration with new fabrics and padding, Jad will work hard to please you. He offers years of quality craftsmanship experience along with a dedicated staff that is on hand to consult, advise and assist in your project, whether it's a small or large project. They stock a large selection of discounted fabrics and have sample selections from all the major fabric manufacturers. They also stock commercial vinyl. From restoration to touch-up, Jad again brings years of experience. Many times people feel an item may need to be entirely stripped and redone. Jad recognizes that this is not always the case and can sometimes restore the piece. Touch ups can take away those unsightly scratches and scuffs. They offer stripping and refinishing for all your furniture including antiques. Services offered include cleaning and repair. A & JAD's strives to provide exceptional customer service and offers pick-up and delivery and can provide written estimates for insurance and military claim estimates.